Rgveda is the Veda of knowledge: Knowledge of existence, Being and Becoming, from the Zero hour to 2400 hours of cosmic time in this cycle of creation. At the Zero hour, the state of Being, whatever it was or was not, is beyond thought and words because thought and words 'then' did not exist. There was neither 'Sat' nor 'Asat', neither Being nor non-Being: everything we call 'existent' or 'non-existent' in our language lay asleep, deep in the Dark, darker than Darkness itself, except That Eternal One with Its own potential, Svadha, awake as ever, self- breathing without breath and air (Nasadiya Sukta, 10, 129). That one moved to thought and Sankalpa, and that Sankalpa was the Big Bang when the zero state of time and existence exploded into Rtam and Satyam, the Constant and the Mutable, according to the Ratm Law of Mutability. There the creative evolution started (10, 190). 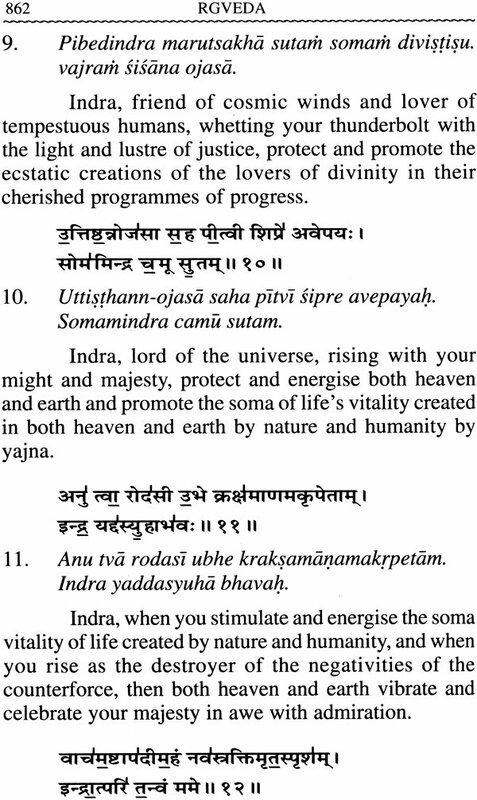 Rgveda describes the tri-union of Ishvara, Jiva and Prakrti (Nature), the evolution of Prakrti into thought SA(Satva), energy (Rajas), and matter (Tamas), the various divine reflections of the One Divinity into Its existential manifestations such as Agni, Vayu, Indra, Soma and others, various material, biological and post-biological forms, the nature and character of the individual and society, corporate living, and the Divine Covenant, Communion and Reunion of the human with the Divine. 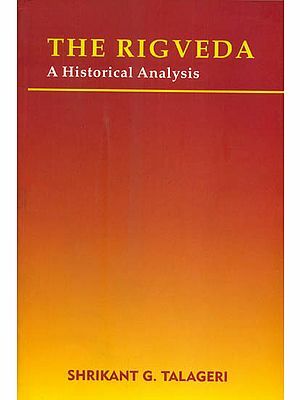 Rgveda begins with the individual's connection with Agni, parental power, light, inspiration and life of life, and ends with the social commandment: Live and move together, speak together, know one another's mind in unison, and all of you observe your Dharma as the wise of all time do, to achieve your goals in life (10, 191). According to Rgveda, the universe is an expansive universe, a Virat Purusha, a real, living breathing, intelligent, organismic, self-organising, self-conscious, sovereign system, the Soul of which, immanent and transcendent, is the Supreme Brahma(10,90). Dr. Tulsi Ram Sharma M.A., English (Delhi, 1949), Ph.D. (London, 1963) has been a university professor, academic administrator, researcher, and writer of long standing with prestigious assignments. Besides his professional studies of secular literature in English, Hindi, Sanskrit and Urdu, Dr. Tulsi Ram Sharma has devoted his life and time to the study and discipline of Sacred literature specially Vedas, Upanishads, Darshan Philosophy, Puranas, Ramayana, Mahabharata with concentration on the Bhagwad Gita, Greek, Roman, Sumerian and English Epics, Gathas of Zarathustra, Bible, Quran, and the writings of Swami Dayananda, and Swami Vivekananda, in search of the essential values of Sanatan Vedic Dharma with reference to their realisation in life and literature through social attitudes, collective action, customs, traditions, rituals and religious variations across the fluctuations of history. I have had the privilege of going through some of the chapters of Yajurveda Bhashya written by Prof. Tulsiram, a well known Vedic scholar and author of English language and literature. 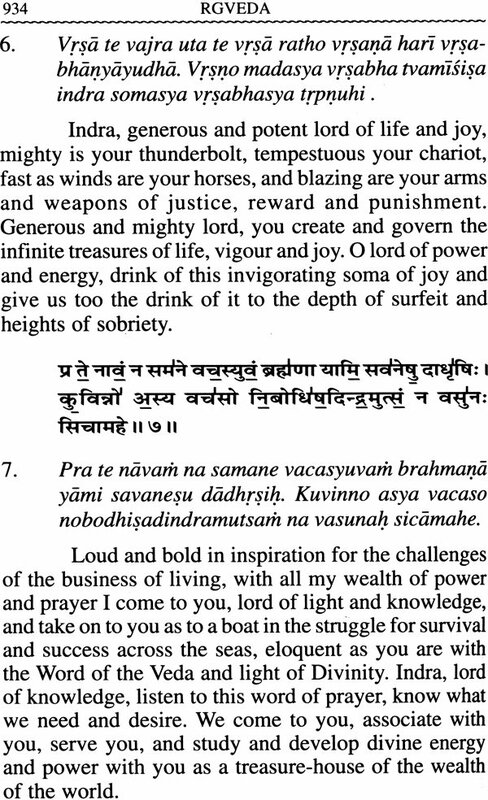 I congratulate him because he has done this translation for an average English reader who is keen to know the Vedas. Knowledge of the Vedas is like the knowledge of science. Vedic language is a scientific language and nobody can understand that without the profound knowledge of Vedangas, especially Nirukta of Maharshi Yaska and the grammar of Panini and Patanjali. 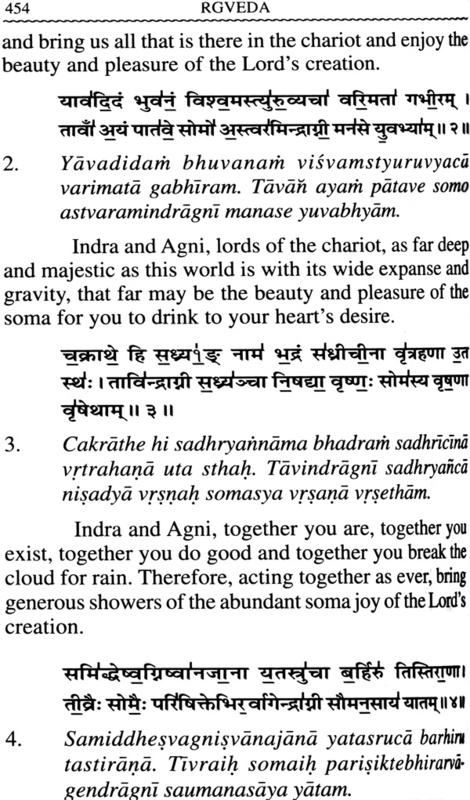 Nobody can interpret the Veda mantras without these two. This translation proves that Prof. Tulsiram has done this insightful translation after doing hard work in both Vedangas. In translating the Vedas, only literal meaning is just not sufficient, sometimes it may create confusion and contradiction. Prof. Tulsiram deeply merges himself into Vedic Mantras, thinking deeply about words, derivatives and analyzes the hidden nuances of meaning in their context. For example, 'Sumitriya na aapa oshadhayah santu . Yajur. 36, 23': If we take literal meaning in the ordinary sense, "may the waters, vital forces of life, and herbs be friendly to us and may they be enemies to those who hate us and whom we hate", it will not make acceptable sense. After raising some questions, he says, "How can we accept this?" So, after going deeply into the words and context he gives this meaning of the said mantra: May waters, tonics, pranic energies and medicinal herbs be good friends of our health system and immunity and let the same waters, tonics, pranic energies herbal medicines act against those ailments, diseases and negativities which injure us, which we hate to suffer and which we love to destroy, moreover let them have no side effects because side effects too help the negativities and injure us. After giving the actual sense of the Mantra he writes that this Mantra is a reasonable prayer for the health programme of an advanced society, and then, logically in the next Mantra, follows the prayer for a full hundred years and more of life and healthy living (Tacchakshurdevahitam purastat-Yajur.36,24). The translation by Prof. Tulsiram is without any extraneous motive and without any extra-academic intention. 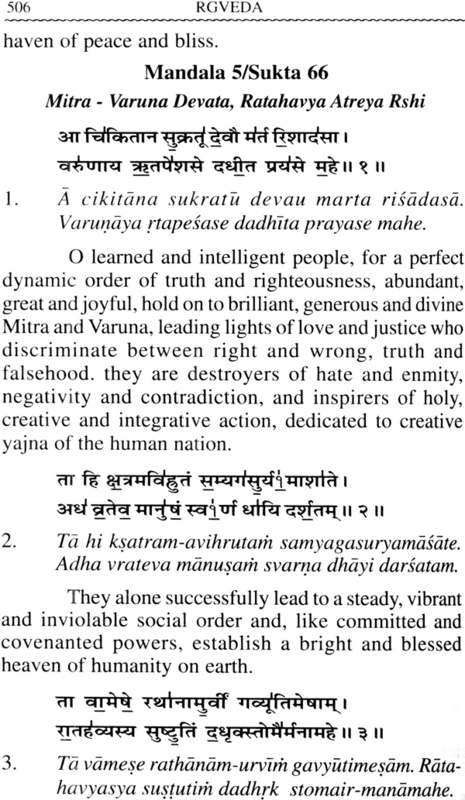 The translation has been done purely as communication of the Vedic message for the welfare of mankind. While giving his opinion on the Vedas Prof. Tulsiram writes in his Introduction . 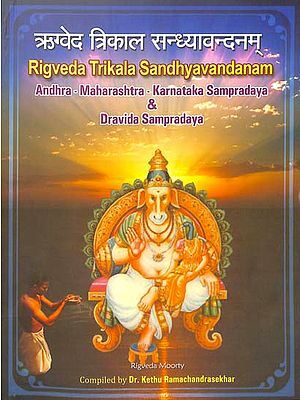 Veda is the Voice of God revealed in scientific Vedic Sanskrit free from local color and historical facts, therefore Vedic language is to be interpreted and understood according to its own laws and structure, and the only key available for such interpretation is the Nirukta of Maharshi Yaska and the grammar of Panini & Patanjali. According to Maharshi Dayananda Saraswati, 'without reference to these bases of Vedic interpretation certain words have been given a distorted meaning in the translations of Max Muller, Griffith, Whitney and even Sayana.' Actually the torch light for proper translation today, as Aurobindo says, is the Arsha tradition followed by Maharshi Dayananda Saraswati. At the end I will say that this translation of Yajurveda, based on Nirukta and Grammar, follows the known ancient Indian tradition. It is factual, without prejudice or hidden motive. Prof. Tulsiram thinks deeply on every word of the mantra, looks into the context and etymology according to Nirukta and then does the translation. I congratulate him on this one more pioneering step to make the knowledge of Vedas available to the western world and the average English knowing reader. May God give him long and healthy life so that he continues to do this kind of stupendous work. What is Veda? What is it all about? Is it old or new? If it's old, what is its relevance today? And if it is relevant, is it relevant to me also? Or is it relevant only to some particular community in some particular country at some particular time? These are relevant questions especially in an age of science, democracy and globalism. Veda is Divine Knowledge in metalanguage. The very word 'Veda' means knowledge. It is derived from the root 'vid', which means: 'to be, to know, to think, to benefit from' and 'to communicate' . So whatever is is Veda: the very world of existence is Veda. The knowledge of the world of existence is Veda. The extension of knowledge through thought and research further is Veda. And to use that knowledge for the benefit of mankind with the protection and preservation of nature and the environment, without hurting any form of life, that is Veda. Veda is knowledge, pure and simple, as science is knowledge. Science is knowledge of nature as nature is and as it works according to its own laws. In science, there is no story, no history. Similarly in the Veda, there is no story, no history. And just as science is knowledge in scientific language free from local colour and historical variations of form and meaning, so Veda too is knowledge in scientific language free from local colour and historical variations. Therefore Vedic language has to be interpreted and understood according to the laws and technique of its own structure as stated by seers such as Yaska, Panini and Patanjali and as explained by Swami Dayananda in his grammatical works and his notes on Vedic words in his commentary on the Vedas. But there is a difference between scientific knowledge and Vedic knowledge: While science is knowledge of nature to the extent that man has been able to discover it, Veda is the quintessential knowledge of all that is, including Nature and humanity, all that happens, all that we are, all that we do, and all that we reap in consequence of our action. It is the Original and Universal knowledge of the Reality of Existence and the Ideality of our aspirations, covering the facts and processes of existence, their interaction and the laws that operate in the interaction. In short, Veda is an eternal articulation of Omniscience, The Voice of God. Rgveda is the Veda of Knowledge, Yajurveda is the Veda of Karma, Samaveda is the Veda of Bhakti, and Atharva-veda is Brahma Veda, an umbrella, celebrating the Divine Presence as in Book 10, hymns 7 and 8. Rgveda is the Veda of knowledge revealed by Parameshvara, Lord Supreme Himself. All the four Vedas were received by the primeval Rshis from That Supreme Divinity (Rgveda, 10, 90, 9). That Supreme power and presence is One and only one, wise sages call it by many names such as Agni, Indra, Mitra, Varuna and others. That one Lord creates this wonderful world of many forms and pervades it simultaneously (6, 47,18). The creative evolution begins from that and when one cycle is complete, the involution ends up therein (10, 129, 7). The light of the sun radiates from there (10,37,3), the streams of life flow from there through the medium of five elements (1, 164, 3). We' too come from there and retire unto That when the existential sojourn terminates (8, 44, 23), that is the covenant of man and God. The truth of Vedas is eternal (5, 25, 2). Law is eternal (4, 23, 8). Our life is a lovely sojourn of our active and intelligent choice (5, 1, 2; 6, 15, 9) in the fivefold body (5, 47,5), or outside the body (1, 164,30), in a homely paradise on earth (6, 120, 3), or in a fools paradise (9, 64, 20-1). Therefore the one basic commandment of Vedas is "Be man", intelligent human being (10, 53, 6), be a visionary which you ought to be (1, 31, 6), in the category of Deva, godliness (1,68,2), remembering fully well that each one comes alone for a short time (10, 97, 5), to live in a house of clay (8, 44, 23) which is not our ultimate destination. Therefore our self- fulfilment lies through breaking the threefold bonds of body, mind and spiritual ignorance (1, 24, 15), rise beyond the darkness and reach the light Divine (1, 50, 10). The Light is our real potential as children of Immortality, unhurt, imperishable (1, 148,5). 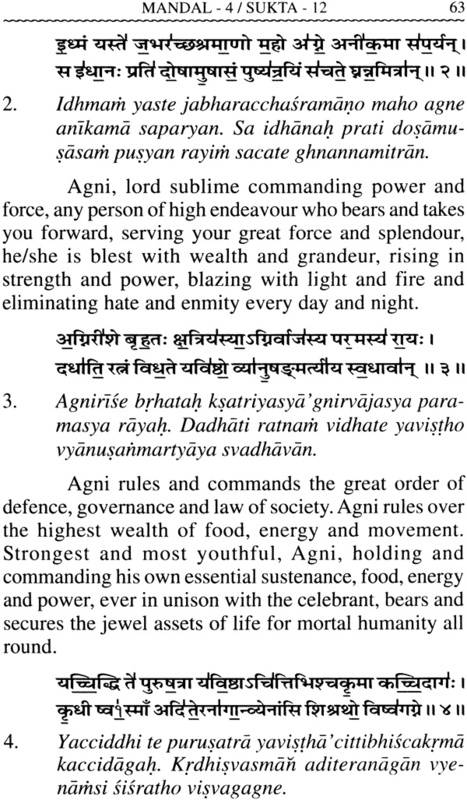 Rgveda begins with an invocation and prayer to Agni, Lord of light and energy, giver of life and light, the first, original and ultimate High-priest of the yajna of creative evolution and ends with a prayer to Agni for the gift of the fragrance and nectar of yajnic life from the vedi of the earth. It exhorts humanity to live together in creative and cooperative unity, to act and move together, to speak together, and to think together for a united decision and common achievement, knowing each other's mind in harmony in the same tradition as the ancient wise followed in the performance of Dharma. Rgveda gives a clear picture of the socio-political and economic organisation of humanity from the local to the international level. The Vedic word for a brilliant, enlightened, sovereign republic is Swarajya (3, 49, 2; 3,46, 1; 3, 45,5; 1, 36, 7). The word for such an organisation is Rashtra. For such a Rashtra, efforts have to be made (1, 80,9), there should be three assemblies: the Executive, Legislature, the Law and Order and Defence forces (3, 38, 6), and the Educational Authority. The ruler and the assemblies have to be elected by the people from amongst the educated and socially dedicated people (Atharva, 3, 4, 2). 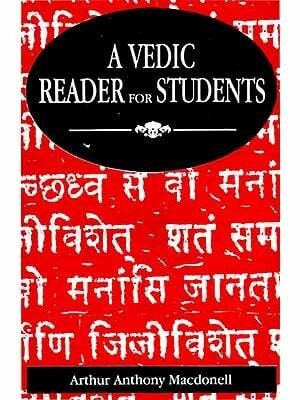 Yajurveda and Atharva- Veda provide further details. The Vedic ideal of any human organisation and its law is that the organisation, in order to be just, creative, productive and egalitarian, must be an organism, a living, intelligent, self-organising, autonomous sovereign system. The universe, the social system too, is a Purusha, a person (10, 90,2) of which the intellectual is the spokesman of values, of knowledge, rectitude and piety, the law and order and defence forces are the guards, the produces are providers, and the ancillary services are assistants, all governed by law which should be a human version of Rtam, the law of Nature and Divinity governing the universe. The Hour beyond the hour. Breathing alone without breath Ever awake. The flow consumed in the point of no dimensions Potential Infinity. This is Vision beyond the vision of mind, the mystery of Rgveda. Between this point of Potential Infinity for creation and the time of cosmic dissolution there is the evolutionary and involuntary interplay of natural forces Agni, Indra, Soma, Pusha, Vaishvanara, Ashvins, Savita, Maruts, Sarasvati, heaven and earth, and the social dynamics of humanity for four billion and three hundred and twenty million years, a drama of infinite variety, ultimately all sucked in into the mysterious Black Hole, and then the breath out, back again. So, says Rgveda, be good, do good, and make the world noble (Rg. 9, 63, 5). Samaveda is Bhaktiveda in song, a symphony of Veda mantras chiefly from Rgveda in celebration of the Truth, Beauty and Goodness of life and the Power, Glory, Sublimity and Beatitude of Divinity. It begins with an invitation to Agni, Light and Life of the universe, moves to Indra, the Power and Glory of Divinity and then to Beatific Soma, divine Spirit of peace and universal joy, and ends with thanks and prayer to All-listening Indra, All-embracing Pusha, inviolable Tarkshya, and Brhaspati, Lord of Infinity, for the gifts of peace, progress, prosperity and total well being. Yajurveda is Karma Veda, knowledge of the application of knowledge in practical living in a positive, creative and constructive manner at both the individual and the collective level. This way of living and working is "Yajna" which, in simple words, means a selfless and participative way of living and thereby creating the maximum out of the minimum for all, including nature, humanity, the environment and the whole universe, with complete faith in the living, breathing, intelligent self-organising, self-conscious, Sovereign System. Living the yajnic way, we realise that Nature is an organisn, a tree, Ashwattha, and the entire cosmos including ourselves is a Purusha, and we as human beings are but cells in this Divine Purusha. Without living this way in a state of full awareness, we cannot realise that you and I, Mother Nature and the Supreme Brahma are all together, one in union and communion. Vedic knowledge then is the Divine knowledge of existence from the dimensionless point and particle unto Infinity. And prayerful living and communion in meditation and yoga means: Self-integration of the particle, Re- integration of the part with the whole, and Re-Union of the finite with the Infinite. This is the climactic close of Yajurveda: The light and life that shines in and beyond the sun is that Supreme Purusha. That is there, and that is here, in me too. Om is the saviour. Om is Bramha. Bramha is Infinite, Sublime! The message of Yajurveda begins with the rousing divine call to live: "Be vibrant as the winds!" But we must be gratefully vibrant: "0 Lord we pray for and thank thee for the gift of food and energy for life, for the health and efficiency of body, mind and soul." All of us must dedicate ourselves to Savita, giver of life and light, with devotion to the highest, yajnic, action, we must not hurt the 'Cow', and we must not allow a thief to boss over us and deprive us of our creative freedom of thought, word and deed. Atharva- Veda is Brahma Veda, umbrella knowledge of existence both Murtta and Amurtta, concrete and abstract. It is the knowledge of Prakrti, Mother Nature, as well as of Purusha, the Soul, the individual Jiva as well as the Cosmic Soul Brahma. 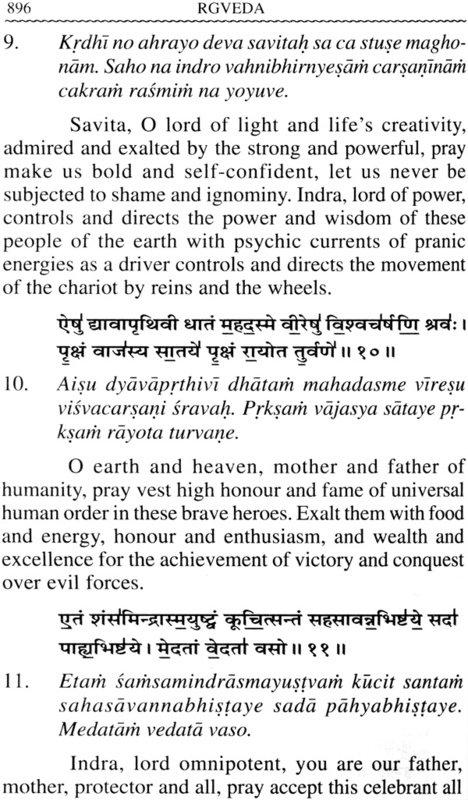 It begins with a celebrative description of the thrice-seven variant evolutes of Prakrti and a prayer to Vachaspati, Lord of Nature and the Word of Knowledge, to bless us with strength, energy, intelligence and knowledge emanating from those thrice-seven forms of the world of Nature and Spirit. It covers the world of humanity from the individual to the total collective personality of humanity, including social structures from the family, community and the nation up to the international United Nations. It pays homage to Divinity, Jyeshtha Brahma, Supreme Presiding Spirit and Power, immanent and transcendent, which creates and sustains and winds up the world of existence in each cycle of creation, eternally (10, 7-8, and 19,6). Towards the end Atharva- Veda pays homage to Brahma and Mother Veda with thanks for the gifts of good health and full age, vibrant pranic energy, noble progeny, ample wealth, fame, lasting achievement and divine lustre of life. These are the gifts of Vedic knowledge in life, and when one cycle of existence reaches the hour of completion, the Mother Knowledge returns to her eternal and Original abode, Jyeshtha Brahma Itself, the mighty, mysterious, awful Silence, impenetrable Darkness, Smaller than the smallest conceivable, yet Greater than the greatest imaginable, the Original and Ultimate Home of all that matter, energy, thought and Speech is, beyond time and space. As you open the text of Rg Veda, you find the words: Agni, Madhucchanda Rshi. 'Devata' here means the subject which is dealt with in the mantra. 'Devata' as a Vedic term means a presence, a power, a force, which is brilliant, illuminative, and generous. 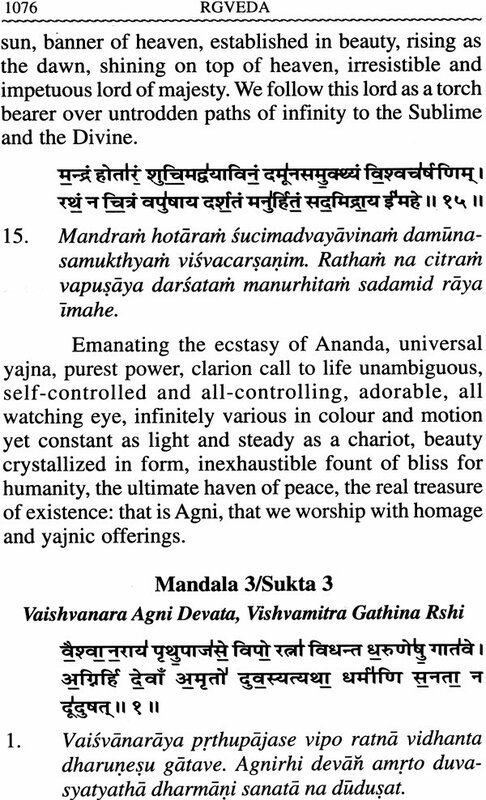 The 'Devata' of a mantra may be God, the One Sacchidananda Brahma as in the closing mantra quoted above, or Savita, the same One self-refulgent God as in the opening mantra of Yajurveda, or it can be a generous divine power of Nature such as the sun, moon, earth; or it can be a noble person of brilliant quality of nature, character and performance as a ruler, leader, commander, teacher, etc. What the 'Devata' means in any particular mantra depends on the total context that emerges from the mantra in its thematic environment of the hymn. Madhucchanda is the Rshi of the opening mantra. The Rshi in the Arsha tradition is not the author of the mantra, Rshi is the exponent of the meaning of the mantra. As Maharshi Yaska says in the Nirukta, Rshis are the 'seers of the mantras: they are the sages who went into deep meditation unto the universal frequency of the Cosmic Mind and experienced the voice of Divinity speaking in the mantra, the mantra, a semantic correspondence of the Divine Voice, the Divine Voice, a sound correspondence of Divine Awareness of the Reality of Existence in the modes of Being and Becoming. Who then is the poet of the Vedas? The answer is in Yajurveda 40,8: That Cosmic Spirit which pervades and rules every moving particle in the moving universe is "the poet, thinker, all-comprehending, and self-existent". That is the Lord who creates the world of existence, ordains the Laws of its dynamics, and reveals the poetry of its beauty and majesty, the Vedas. "From that Lord of universal yajna were born the Rks and Samans. From Him were born the Chhandas of Atharva-veda and from Him were born the Yajus", (Yajurveda 31, 7). The Vedic lore comes in Pura-kalpa, the beginning of the world of humanity (Shvetashvataropanishad, 6, 22) and when its function is over at the end of the kalpa, one cycle of existence, it retires into Brahma-loka (Atharvaveda 19, 71, 1). The Vedas were revealed by the Lord Omniscient to four primeval Rshis: Rgveda to Agni, Yajurveda to Vayu, Samaveda to Aditya, and Atharva-veda to Angira, directly in their spiritual consciousness. The Sage Brahma received and collected the four from them and passed them on to other sages. When were the Vedas revealed? What is their age? How old are they? As old as the age of humanity on earth. The Lord who creates humanity leaves them not to nature like animals. He enlightens them with the knowledge of existence and their place in the world with the vision of their journey and its culmination. Swami Dayananda works out the age of the Vedas on the basis of Surya Siddhanta which in the year 2010 A.D. comes to 1,96,08,53,110 years. If someone does not accept it and insists on historical proof, let us listen to Max Muller from whom we learn of the problem of the date or dates but with no possibility of solution on scientific and historical grounds. Max Muller is known as a world renowned Vedic scholar and exegesist of the West. Max Muller once ventured to pronounce a purely arbitrary date based on unproven assumptions that around 1200 B.C. was the date of the Rgveda. Later, he himself warned his students that "Whether the Vedic Hymns were composed in 1000 or 1500 or 2000 B.C., no power on earth could ever fix .... Whatever may be the date of the Vedic hymns ... they have their own unique place and stand by themselves". Such daring presumptions of western scholars about the date of the Vedas are exposed by Graham Hancock in his latest researches, in his explosive book: Underworld: The Mysterious Origins of Civilization (2002). Max Muller himself in his Gifford Lectures in 1890 had confessed that "no power on earth could ever fix" the date of the Vedas. Even Mitchiner himself concedes that "the dating of Sanskrit texts is a notoriously difficult problem" (Quoted !bid p. 131). Who could then possibly speak the truth about ancient Indian civilisation and the Vedic literature? Says Hancock (p. 105): "Perhaps we are coming to a time when ancient India will speak for herself again after millennia of silence." It was Swami Dayananda who spoke for India and the Vedas in the Rshis' tradition after millennia of silence to correct the distortions of Indian history and redeem Vedic literature and the Vedic tradition. Since Vedas are the oldest recorded knowledge of the world, no one can guess how much time, even ages, might have passed between the Vedas and the next work in Sanskrit. If so, there is no other work in Sanskrit comparable to the Vedas. Consequently the language of any other work would not provide any clue for the interpretation of Veda mantras. Vedic language then has to be interpreted on its own, and the only key available for such independent interpretation is the Nirukta and Nighantu of Maharshi Yaska, the grammatical works of Panini and Patanjali, and Swami Dayananda's notes in his commentary on Vedic verses explaining the structure and meaning of the words. Without reference to these bases of Vedic interpretation, certain words have been given a very distorted meaning in other translations by Max Muller, Griffith, Whitney, and even Sayana. The torch light for proper translation today is the Arsha tradition followed by Swami Dayananda. The Arsha way is the only right way, the key, to discover the truth of the Vedas. According to Shri Aurobindo, Swami Dayananda alone, in modem times, possessed this key to the secret of the Vedas. Interpreted this way the Vedas shine in their essential scientific refulgence. As science is pure knowledge, no story, no history, no mythology, so are the Vedas, pure knowledge: knowledge of nature, mind, spirit, human society, Dharma, the dynamics of existence and the right way of living as individuals and as members of organised society upto the international level. Even Max Muller, though he was once committed to uprooting the religion of India by his arbitrary translation of Rgveda, had to admit in his Biographical Essays that: "To Swami Dayananda, everything contained in the Vedas was not only perfect truth, but he went one step further and, by their interpretation, succeeded in persuading others that everything worth knowing, eventhe most recent inventions of modem science, were alluded to in the Vedas. Steam Engines, Electricity, Telegraphy and Wireless Marconogram were shown to have been at least in the germ known to the poets of the Vedas". 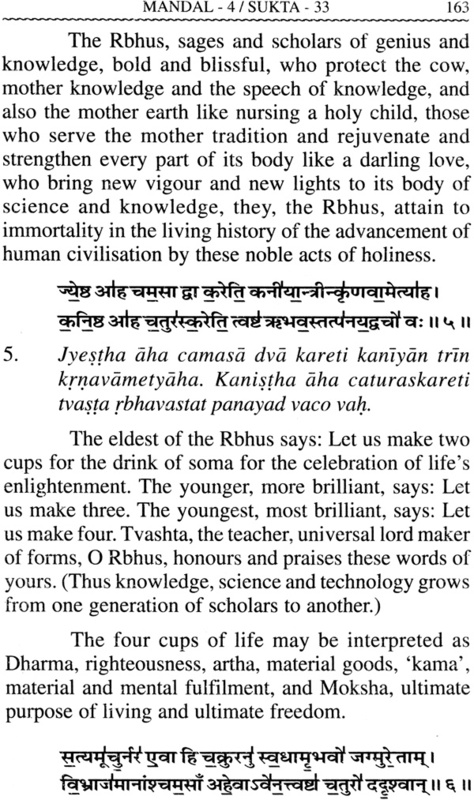 In fact Shri Aurobindo in his essay on "Dayananda and the Veda" goes even further: "There is nothing fantastic in Dayananda's idea that Veda contains truth of science as well as truth of religion (i.e., Dharma). I will even add my own conviction that Veda contains other truths of a Science the modem world does not at all possess, and in that case, Dayananda has rather understated than overstated the depth and range of the Vedic wisdom (see 'Bankim, Tilak, Dayananda' , p. 57). The basic requirement of scriptural interpretation for us is faith and intelligential solemnity, not doubt and cynicism. This way, if we want to confirm our faith in the scientific vision of the Veda, refer to Rgveda 1, 34, 7 and 9 for three- stage rocket chariot of the Ashwins, to 1, 36, 18 for Agni missile, to 1, 37, 3 for winds and communication, to 1,46, 10 for concentration of light, to 1, 52, 1 and 1, 36, 1 for the science of missile defence and space-craft, to 6, 46, 11 for missiles and war heads, and so on. The position of the solar system with planets and satellites, earth's and sun's gravitation, solar healing, parliamentary democracy, organisational structure of the nation and the international world, water and electric energy, and so many other subjects are hinted at in Vedic verses. We need serious research to work out the details. Had even Einstein read the Purusha Sukta of the Vedas, Brahma Sutras and Sankhya Vaisheshika philosophy, probably he would have found clues to his search for Unified Field theory of the universe. Beyond faith and intelligential solemnity we need vision, potential Darshan of the Vedic Rshis. Once you have had the vision of truth, doubts disappear and questions recede into silence because, then, nothing shines but the Truth, and Divinity Itself reveals It's Reality with showers of Grace. In this mood and in this spirit, I suggest, you start your search for Vedic Truth and the Mystery of Existence. Lastly, if the Vedic lore is as old as humanity itself, what is its relevance today in the modem world? Ask yourself other questions: What is the relevance of Galileo or Newton or the Theory of Relativity, two plus two makes four, Swaraj, the Vedic word for freedom and self-discipline? Truth is truth, when the statement was or is made is irrelevant. Vedic truth, if you find it convincing and acceptable, is relevant not only for today but also for all time, to every person, everywhere. Just as I speak (reveal) this auspicious holy Word of the Veda for all people (without any discrimination of high or low), so should you too communicate it to all people of the world whoever, whatever, wherever they be. 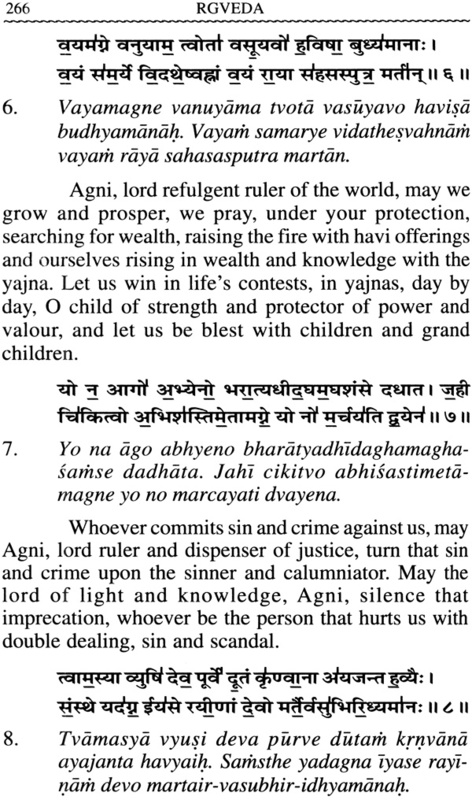 The Religion of the RigVeda.